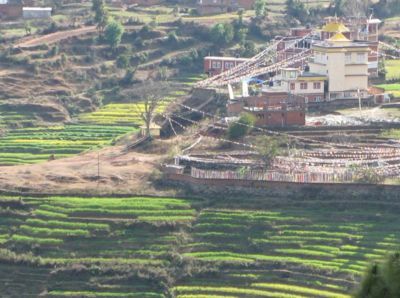 The Palyul Retreat Centre of Samten Ösel Ling is located in Yangleshö, an exceptionally sacred place that was blessed by the actual presence of Padmasambhava, the Great Master of Oddiyana, who is the embodiment of all the buddhas’ omniscient wisdom. Work began on the auspicious date of the tenth day of the tenth month during the Tibetan year of 2123 (20th November 1996), when the foundations were laid as offerings of incense were made and a tsok feast was performed. When just half the work was completed, on the tenth day of the tenth month according to the lunar calendar (9th December 1997), the site was blessed by a visit from Kyabje Drupwang Pema Norbu Rinpoche, the great vajradhara of the definitive meaning. Over a period of four days, he granted the empowerment of the Gyutrul Shyitro from the Nyingma Kama and of the Glorious Vajrakilaya from the terma of the Dharma Regent Ratna Lingpa to an assembly of more than a thousand students from many different nationalities. This act of inconceivable and inexpressible kindness marked an auspicious beginning, and opened the door to the teachings of the great secret Vajra vehicle. When, after one and half years’ work, the construction was completed, and the sacred images were installed inside the building, Kyabje Chatral Rinpoche Sangye Dorje, the great hidden yogi of the Clear Light Dzogpachenpo, presided over an assembly of members of the ordained sangha. It was on the tenth day of the fourth month of the Tibetan year 2125 (4th July 1998) that they performed an elaborate and traditional consecration ceremony by invoking the blessings of the wisdom deities. Thus it was that the beginning, the middle and the end of the building process were entirely virtuous in every respect, and left us in no doubt that the study and practice of the Great Secret Essence would only flourish and increase. The exceptional work done with an altruistic motivation is surely a cause for celebration, such as, for example, how the head of the building team, Prakash from Yolmo, ensured that everything was done to the highest standard and yet at the lowest possible cost. Throughout the project Khenpo Namdrol took charge, and worked to the best of his ability out of the wish to be of benefit to beings and to the teachings. As can be seen clearly from the accounts set out below, which have been acknowledged by Kyabje Penor Rinpoche, all of the offerings made out of devotion were put to good use, and there is not the slightest amount that is unaccounted for. This page was last edited on 10 January 2012, at 02:15.